I have completed UX and/or visual design work for the app landing page, newsletter landing pages (and placements), weather, horoscopes, sections in search results, subscription landing and messaging, SRW, Fund for the Needy, Media Solutions, and NIE sites. UX and visual design work for the future development of Media Kit and Company sites, ad placements and podcasts. 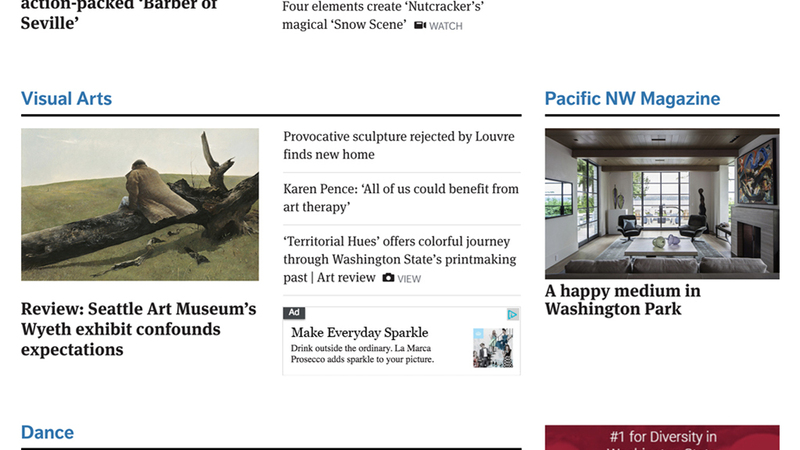 In collaboration with a copywriter, designed a page for the promotion of The Seattle Times Print Replica. We were tasked with showcasing the features of Print Replica (on the Android app, iOS app, and on the web), and clearly distinguishing between these three ways of receiving it. Formatted assets and worked closely with a developer (providing QA notes) through to launch. 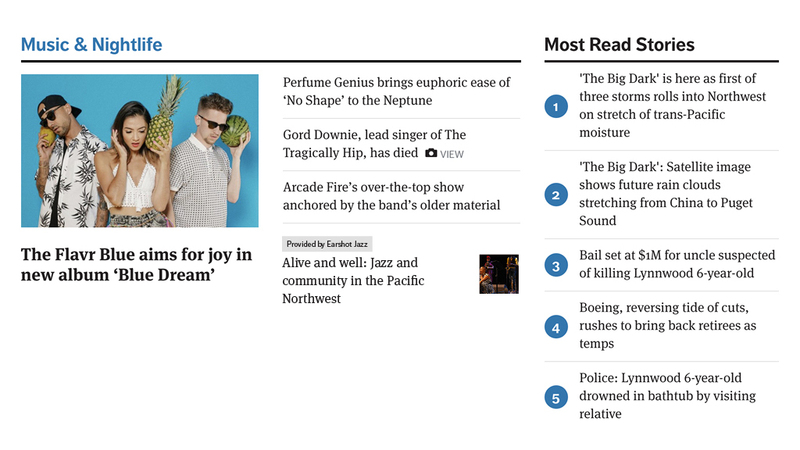 Explored implementations of “headline ads” on The Seattle Times homepage (and several additional pages). Conducted a comprehensive competitive audit of homepage ads and technical research into requirements for said ad units. Designed native, programmatic, and “direct sold” variations of ad units. Created mockups for review, approval and testing. Worked closely with a developer (providing QA notes) through to launch. Assisted in writing, moderating and synthesizing the findings of a user research test of the headline ad units (which revealed the project to have been a success). Designed an immersive template for Special Sections, produced by Advertising Publications. The Special Section template needed to be able to accommodate a combination of sponsored stories, non-sponsored stories, and display advertisements. The goal was to create a layout that would be user-friendly and visually appealing for readers and potential sponsors. 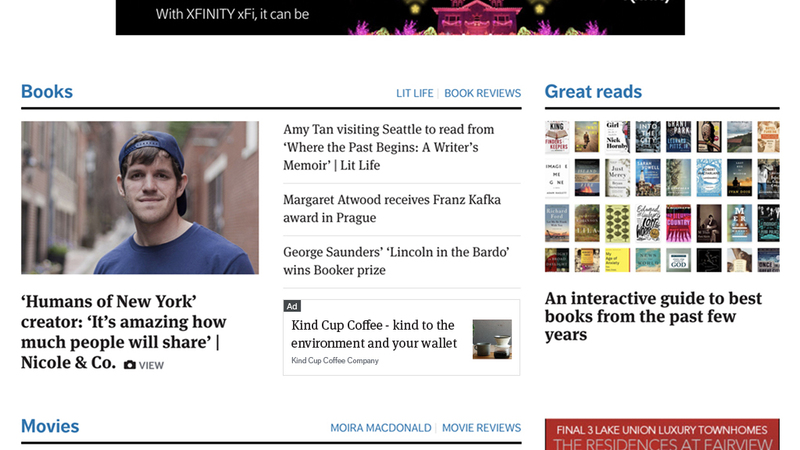 In collaboration with another designer, redesigned The Seattle Times LiveWire event series website for greater usability and visual impact. Identified necessary/desired elements, and completed extensive template research. Created mockups, specs, and assets for customization of the chosen template. Worked closely with a developer (providing QA notes) through to launch. Created a comprehensive style/user guide, which contained guidelines for formatting images, word counts, and editing content.